Before I begin, I extend my appreciation to those of you commenting on my last post with such warm and cheerful congratulations. It is touching to have so many well wishes and positive energy sent my way, and I thank you for sharing your kindness. Now, on to some food business! When I posted the Vegveeta Dip, I did promise to also post the Chocolate Thrill Ice Cream. Here it is folks! Now, all of you in my sweet-toothed club also have a new recipe to dig into! Now, go get your coconut milk, chocolate, and the rest of your ingredients ready for your ice cream maker... and enjoy some smoooooth chocolatey homemade ice cream! 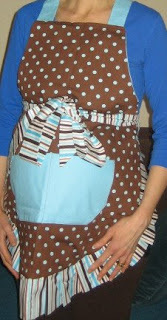 Dreena, I have the same apron, give to me by my husband and I love it! So cute, you put it on and you just want to cook. Congrats on the baby btw. I am so excited for you, and love to hear your insights into baby rearing as a vegan momma. Is that your pregnant belly? So cute. Oh, congratulations on the baby! That is so exciting! Good luck with the project and getting your schedule under control. The ice cream sounds delicious, I can't wait to try it! Adorable apron! Thanks for the great recipe too - still trying to convince the husband that I need an ice cream maker! That Chocolate thrill ice cream looks so yum!!! I recently tried so delicious coconut milk line of ice cream, thanks to your review... pretending I didn't notice the price, I found it unusually light yet very rich and creamy... definitely a winner! I would love to try this recipe as well- except I'm more of a vanilla/other flavor ice cream person, how strange am I!? Congrats, Dreena! Your baby bump is too cute! I made this yesterday. Smoooooooooth, creamy and CHOCOLATEY! First out of the machine it was light soft,fluffy & coconuty which was divine. Not too sickly sweet which made for eating in excess. Next day it was a little harder but still scoopable (after a few minutes on the counter to thaw) - coconut flavor was less pronounced and it was more chocolatey. Still amazing. I will never buy regular ice-cream again. I hope there are other flavor options to follow? anonymous, that's wonderful! I'm really pleased that you enjoyed it and found it chocolately without too much coconut flavor. I am playing with other flavors, for sure!! :) Thanks for the feedback. Hi, this chocolate icecream is my very favorite chocolate icecream recipe! I used it recently in an icecream cake and I was going to put the link to the recipe (I used it in an icecream cake I made) but it seems it's missing on your recipe blog?? Luckily I have it written down for myself, but if you ever put it up again I'd love to add that link!